I came to the beef business from a completely different career path and about the only dealings I had with beef were making the occasional burger and buying a steak dinner for whoever I was schmoozing at the time. The learning curve has been faster, harder and steeper than I even realized and it seemed appropriate to try and break down the USDA Grading system into something simple and understandable. 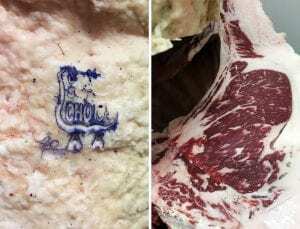 Marbling – the amount of intramuscular fat in the section of ribeye inspected by the USDA. 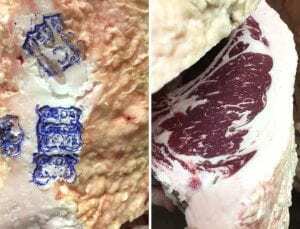 Yield Grade – the amount of fat between the outside of the ribeye and the skin – fat that would basically turn to gristle when the steak is cooked. “Prime”, “Choice”, “Select”, “Standard”, “Commercial”, “Utility”, “Cutter” and “Canner”. The most commonly found grades in the general consumer market are “Select” and “Choice”. Prime generally comprises less than 4% of the total United States production. The grades below “Choice” and “Select” are generally used in processed food items … canned soup, frozen dinners, etc. Like all commodity markets, a big part of what makes the fresh beef system in our country function in product flow through the system and keeping the price efficient is paramount to maintaining the flow. The less than 5% Prime beef generally goes to the restaurant market. Very little makes it to the supermarket. Yield Grade is a little more subjective from the consumers perspective, so it’s not quite as common to hear in butcher shop lingo. The fat described by “Yield Grade” is generally trimmed away from the carcass and is sold for pennies. The higher the yield grade – the larger the cap fat – the more of it there is to trim, the less there is to sell. In a perfect world, everyone would raise USDA Prime, Yield Grade 1 cattle, but, there is no way to control it. Everything plays into Yield Grade from environmental conditions, to feed, to genetics. As mentioned earlier, USDA Prime makes up slightly less than 5% of total beef production in the United States. At Nebraska Star Beef our singular focus is to producing the highest quality antibiotic free, hormone free beef possible, period. We average over 30% USDA Prime and if we happen to end up with an animal that does not grade USDA Choice for some reason we do not sell that beef under our brand. In the past, we combined our USDA Choice and Prime beef due to relatively low overall production volume. We have recently made the decision – based on increased production volume – to create a separate line of products for our “USDA Prime” Angus steaks and roasts. Aging is something else that we do that continues to set us apart from other premium programs. We kill our cattle in a small, family owned butcher shop down the road. We also age all of our beef there as well. Aging is the blending of art and science. To properly age beef, the temperature and humidity need to be perfect. It’s also critical to leave the meat in as large of pieces possible. We start by hanging the carcass halves. They age on the hanger in the cooler for 21 days. In that time, the USDA grades the carcasses. At the end of that time, we break the carcasses into “primals” or the large pieces of meat that will be cut into the different steak cuts. These primals are aged for another 35 days. Most meat that has been cut into steaks is long gone after 56 days. At the end of this time, our beef is what we consider “perfect” and our butchers hand cut it into the different steak cuts. They also trim and portion it at this time. They sort the primals by size – no two animals are the same size – and the smaller primals turn into the smaller steak cuts and so on with the larger primals. We then pack the steaks into special cryovac packaging and flash freeze them in an industrial freezer. The faster they freeze, the better they are when they thaw out. If you want to try a USDA Prime steak, we can deliver it to your doorstep. USDA Prime and upper 2/3rds Choice Angus beef are a delicacy normally reserved for restaurants. We sell to plenty of restaurant customers as well, but we keep the best of the best back for our loyal internet customers. We take a lot of pride in having the ability to offer the best steaks in the world to any address in United States to which FedEx delivers. We are a very unique blend of the absolute most traditional beef production but we blend that with cutting edge technology to keep the meat at the peak of freshness and get it delivered to our customers. Nebraska Star Beef truly is where Tradition meets Technology.